Leah Purcell as The Drover's Wife, which she also wrote. 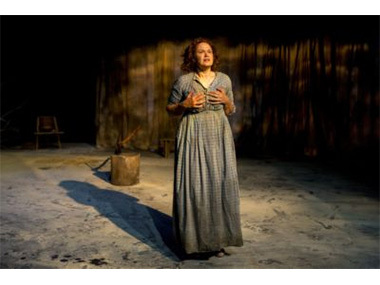 Leah Purcell has been awarded the Nick Enright Prize for Playwrighting ($30,000) in the NSW Premier's Literary Awards, and also the Book of the Year ($10,000), for The Drover's Wife. It's hoped that the play (which ran at Sydney's Belvoir Theatre last year and in which the multi-talented Purcell also starred) will tour nationally and internationally. A film-script is also being developed. Jeremy Eccles wrote a review of The Drover's Wife during the Belvoir run - which we're re-publishing here. Last year Purcell also directed the Channel 7 series, The Secret Daughter, starring Jessica Mauboy. Filming for the second series is currently underway.